Whether they’re short or long, we love scenic drives, especially when we’re driving through gorgeous landscapes and there is an abundance of scenic viewpoints — and the main road through Petrified Forest National Park is one giant, perfect scenic drive! All the best things to do in Petrified Forest — Giant Logs Trail, Crystal Forest, Long Logs and Agate House Trails, Jasper Forest, Blue Mesa Trail, Agate Bridge, Puerco Pueblo, Newspaper Rock, and the Painted Desert Inn — are easily accessible off the main road. And of those, Blue Mesa Road and Blue Mesa Trail is not to be missed! Blue Mesa Road is a short, 3.5 mile, scenic lollipop loop road and the best short drive in Petrified Forest National Park. The “stick” of the lollipop is a two-way road that turns into a one-way road at the loop portion of the road. When you begin the loop, the road climbs to the top of the mesa and offers spectacular views of Blue Mesa and the Painted Desert. There are seven roadside pullouts along the loop road and at each one, we were blown away by the views of eroding funky-shaped sandstone formations, large pieces of golden petrified wood, the blue and purple striped badlands, colorful hills and buttes, desert washes, and giant boulders. We loved the boldly colored, richly textured desert views so much that we decided to enjoy our picnic lunch at one of these roadside pullouts! The last of the seven pullouts features a super short paved trail to an observation platform that overlooks the Blue Mesa Basin and the Blue Mesa Trail. 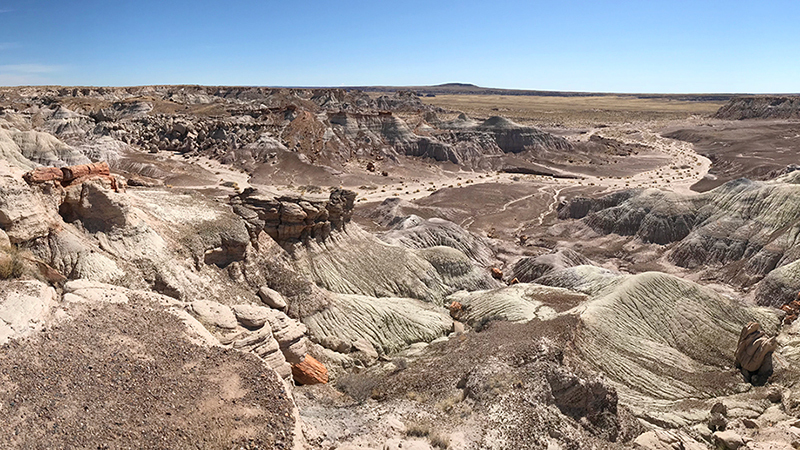 The Blue Mesa area of Petrified Forest National Park is part of the Blue Mesa Member, the second-oldest layer of the Chinle Formation deposited 220 to 250 million years ago. The Chinle Formation can be seen across the Painted Desert badlands, with the Blue Mesa badlands being recognized by it’s trademark mudstone and sandstone layers in purples, blues, greys, whites, pinks, and greens. Blue Mesa Road in Petrified Forest National Park is a 3.5 mile loop road directly off the main Park Road in Arizona 86028, Apache County. The loop portion of Blue Mesa Road is one-way and includes seven roadside pullouts and vista points. Blue Mesa Trail is a moderate, paved/gravel, 1.0 mile loop trail with a quick elevation change of 120 feet. Don’t have time for a hike? Just down the road from the trailhead, there is a scenic overlook with views of the entire Blue Mesa Basin.